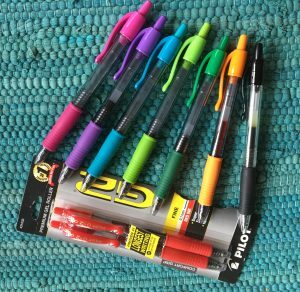 A pen point gliding across college-ruled lines makes me smile! The finer the point, the better. The more color options, the greater my heart’s delight. Clean, pin-pointed black wins most of the time, for meetings, homework, and journaling. BUT, when it’s time to make a grocery list, write a birthday card or special note, matching colors to mood and pretty textured paper is a must. Watching the colors decorate a page is pleasure in penned thoughts. Can you imagine the colors of God-ink that flow from heaven? The beauty of being known. Fearfully and wonderfully made. Created in His image. Known from before the beginning of time to walk, talk, live, love, run, skip, sing, scribble, scream, shout, cry, care, confess, and fall in awe before God’s greatness. Coming to Him as a child, crawling into His Father arms, comforted from the skinned-heart wounds of this world. God is the Author of every one’s life, whether acknowledged or not. He knows us and holds Authorship over our hearts, minds, souls, and every bit of strength we think we grasp. Written in the Book of Life, the promise for our names unfolds when we bend to the wooing Spirit of God. When our hearts are won by the power of God’s presence. When the Author and Perfecter of our faith has whispered His wonder into the depth of our souls, and we say, “thank You” for writing my name with Your blood. 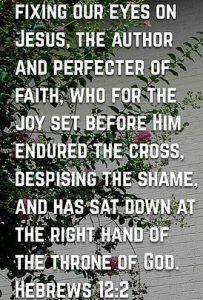 Despising the shame – of utter humiliation, of being spat upon, beaten to a pulp, pressed with a brow full of long-spiked thorns, pounded to a rough-hewn cross, likely with reused, rusty nails, of bowing His head in victory – completely in command of His life and death and LIFE! Because the shame did not and could not hold the Author of every person’s faith. Faith is delicate. One penned chapter earlier, faith is described as “the assurance of things hoped for, the conviction of things not seen” (Hebrews 11:1). Faith is trusting that the pages of my story, though unknown and unseen, will be written until the margins of my life spill ink into heaven’s gates. Until I see Him face to face, and my eyes fill with unworthy tears, and He opens His Authoring arms to my own frail frame. And He enfolds me in His eternally forgiving embrace. Despising the shame ushered my Author to a throne of glory. Death was crushed by His Authorship. To be a letter from Christ written not with ink but with the Spirit of the living God, not on a tablet of stone but on the tablet of my own human heart is to be intimately penned by the Author of all. He put His name on my death sentence so that my name is written in His Book of Life. The Author and Perfecter of my grateful life.